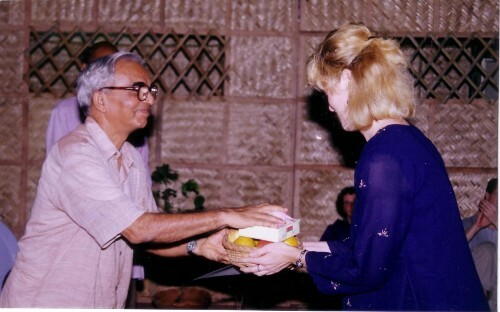 Maggie’s primary teachers were trained by TKV Desikachar at the Krishnamacharya Yoga Mandiram (KYM), where she started her studies with DV Sridhar, Radha Sridhar, and Viji Vasu in 2001 before following them to their own school, Yoga Raksanam in 2002. She has been with them for the past 17 years and goes to India every second year to further her in-depth studies. The Krishnamacharya-Desikachar Lineage (Breath, Meditation, and Vedic Chanting) is the primary focus of the CYT 1000-hour diploma program. In addition, however, Maggie's 10 years of Ayurveda studies with Dr. B. Ganesh of Chennai, India, have led to her discovering the Ayurvedic foundations of the Krishnamacharya lineage. Maggie has also been greatly influenced by her studies of Astanga and Iyengar Yoga, both part of the Krishnamacharya lineage. Into YTI's training, she incorporates 10 years of in-depth studies in Iyengar Yoga (Alignment, Use of Props, Restorative Yoga Therapeutics) with her now retired Iyengar teacher, Lindsay Whalen, and other senior Iyengar teachers, such as Judith Lasater and Elise Browning-Miller. She is also influenced by her 5 years of study in the Astanga Yoga tradition, including in-depth studies in Mysore, India, with B.N.S. Iyengar for 2 months in 2000. Finally, numerous Specialist Faculty and Guest Speakers add breadth to the program by introducing perspectives from other traditions. Maggie is grateful to all her teachers for what she has learnt and continues to learn for her own healing path and that of her students. She is very grateful to Sri T Krishnamacharya for the great sacrifices he made to bring this knowledge to non-brahmins, women, and Westerners. Without his courage and determination to break the social norms of his day, none of us would be enjoying the gift of Yoga in our lives.